With over 400% growth through 2012 and serving over 1000 professional associations and corporations, EventMobi was recently recognized by the event industry's highly-regarded EIBTM Technology Watch Awards (Exhibition for the Incentive Business Travel and Meetings). EventMobi's latest product, EventMobi Fusion is the industry's first HTML5 SaaS platform making it easy for planners to create a mobile event guide that works on all modern smartphones and tablets, even offline. EventMobi was also recognized for its GamifyApp platform, a customizable gamification solution that engages attendees and drives participation at live events. EventMobi's revolutionary platform makes it easy for event planners to create, customize, and edit a mobile app that works on every device and functions offline. … HTML5 is a simpler, faster and cheaper … app development model compared to building native apps and is reflected in lower costs and faster turnaround time. RAPID growth of smartphone and tablet usage by attendees has led to mobile event apps quickly becoming a standard offering at events. EventMobi has now successfully provided mobile apps for over 1000 organizations around the world ranging from professional associations to Fortune 500 companies. The rapid growth has been fueled by the release of EventMobi Fusion, an offline-capable HTML5 platform allowing event professionals to easily build a custom mobile guide for any event. EventMobi Fusion bridges the gap between native and web-based conference app technology, thereby addressing three main barriers for events offering a mobile event guide: internet connectivity, cost, and the time it takes to manage the content for single or multiple event apps. HTML5 mobile technology is utilized by leading technology companies including Apple, Google, Financial Times, and Salesforce. As the first company in the event industry offering a true offline-capable HTML5 mobile event guide, EventMobi is leading the way into 2013 and beyond with a solution that is comprehensive yet simple, and affordable for the majority of event planners. Moreover, Fusion apps are accessible on all modern mobile, tablet, and desktop devices allowing for maximum attendee usage, easily providing the ROI for events building a custom mobile event guide. EventMobi’s effort in creating a viable mobile solution for the event industry was recognized by the 2012 EIBTM Technology Watch judging panel, “For EventMobi’s pioneering work using HTML5 to produce rich, multipurpose apps for event attendees”. Among 56 entrants, EventMobi was selected as one of five finalists. 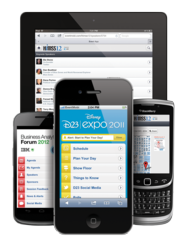 The EventMobi team will be in Barcelona November 27-29, 2012 for the EIBTM trade show, one of the industry’s largest expos to showcase the latest in mobile technology for events. This also marks the opening of EventMobi’s Europe office in Berlin. Having supported a number of events across Europe, Africa, and the Middle East, EventMobi’s Berlin office will allow for enhanced service, multi-lingual support, and extended support hours. Founded in San Francisco and formally incorporated in Toronto in 2010, EventMobi has revolutionized the way event organizers create custom mobile apps for events. Creating a fully branded app in mere minutes, organizers are able to better engage attendees, go paperless, and create new revenue with in-app advertising. Simple and affordable, EventMobi makes it easy for every event to go mobile.